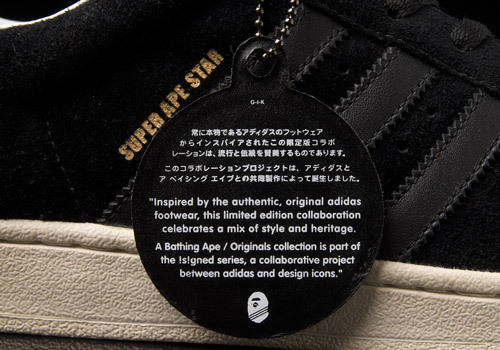 It’s quite likely that if you’ve heard of adidas then you’ve heard of A Bathing Ape (BAPE), however even if you know about the infamously successful Japanese brand name it’s possible you’ve yet to become acquainted with its founder. Tomoaki Nagao (aka Nigo) began his brand in ’93 on a very small scale, selling t-shirts and hooded camouflage sweatshirts to teens. 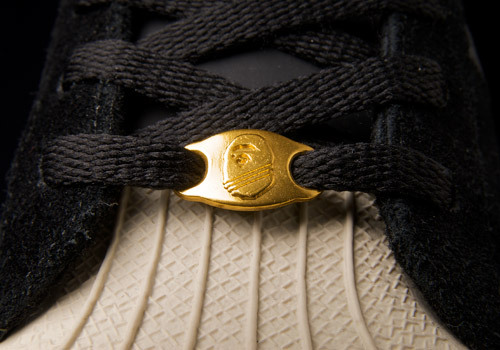 His own shoe the Bapesta pushed him to an international market and from there it was only a matter of time until he was helping to build additional brands such as the Billionaire Boys Club and Ice Cream Footwear. 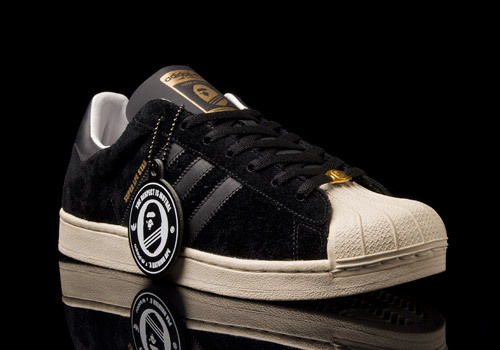 Nigo really hit it big when he began collaborating with adidas Originals on various projects involving both basketball and skate shoes. Since his first release in 2003 he’s put out nine shoes in three different silhouettes. 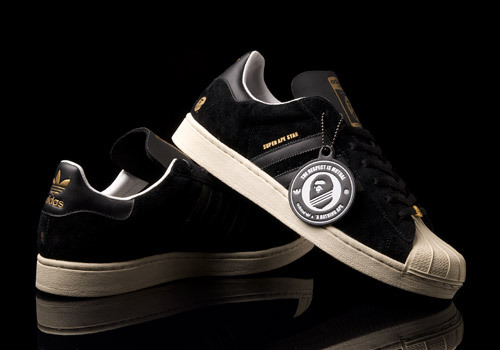 This black, white, “bone”, and gold release is one of the most coveted, limited to only one hundred pairs worldwide, and not even publicly sold (with fifty staying with adidas and the other fifty pairs going to Nigo). 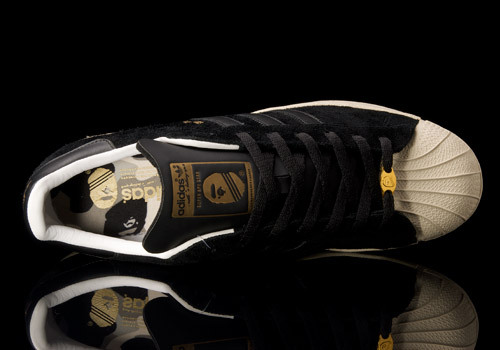 Dropped in 2003 as part of the not-so-well-known !s!gned Series – told by adidas to be a collaborative line in which they work with design icons – the shoe is meant to “celebrate a mix of style and heritage”. 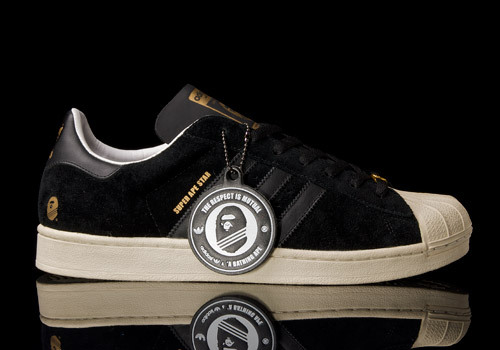 Or at least that’s what the badge tag hanging from the laces says. And we certainly agree. Black suede upper. Black leather stripes. Off-white “bone” shell and sole. 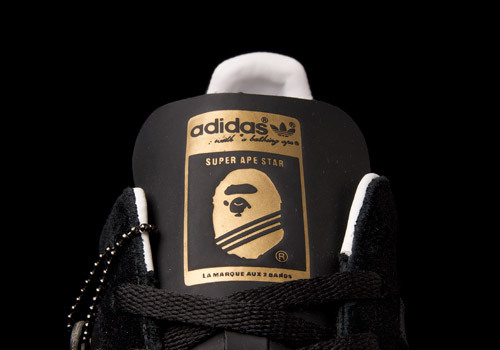 Gold detailing for both the BAPE and adidas Originals branding throughout the shoe. 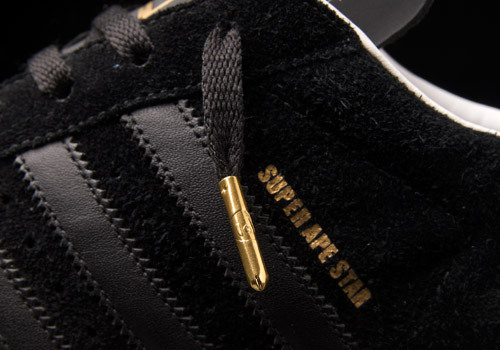 Even embossed gorilla logos pressed into the gold lace tips. These are classy, totally lush, and definitely one-of-a-kind. 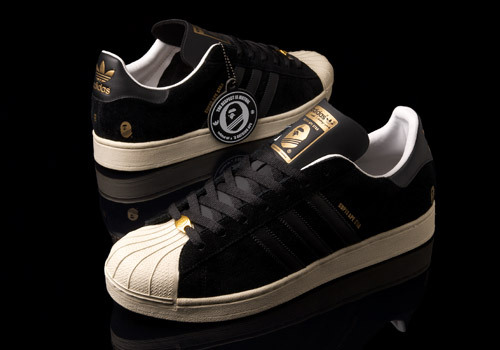 Even without their extremely limited release numbers they’re sure to be high on many Superstar fans’ grail lists.